To read and enjoy Lindsey Fitzharris’ new book, “you should have a stronger stomach than mine,” said Genevieve Valentine in NPR.org. 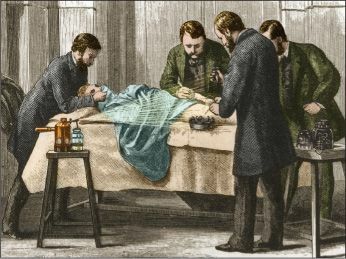 The young historian does her best to paint a vivid picture of early 19thcentury medicine without unnecessary gore, “but so much gore is necessary.” Before British surgeon Joseph Lister introduced antiseptics to peers resistant to the idea, postoperative infections were so common, they were collectively labeled “hospitalism.” If hospitalism struck a limb, the limb was amputated (without anesthesia), and the good doctors who handled the rotting flesh moved on to the next patient without washing their hands. Such scenes are arguably ancient history—except that anyone who’s battling against the enemies of science today could learn from Lister’s persistence. Lister, it must be said, “makes an unlikely hero,” said Wendy Moore in TheGuardian.com. The scion of a wealthy Quaker family, he was, in the 1850s, an easily discouraged, conflict-averse young man in a field dominated by warring egos. Among his fellow surgeons, two theories prevailed about why death so often followed for the unfortunate souls put under the knife. “Contagionists” suspected that infections were transmitted from patient to patient, “noncontagionists” blamed noxious air, and almost no one wanted to consider the potential culpability of doctors’ grubby hands. Lister, armed with a microscope and knowledge of Louis Pasteur’s early work in establishing germ theory, sought a substance that could halt the spread of infection. He chose carbolic acid, a derivative of coal tar used to suppress sewage odors, and in 1865 he reached for it while operating on a boy in Glasgow who’d suffered a compound-fractured leg in a carriage accident. The leg was saved, and within two years, Lister was able to report nearly a dozen other examples of miracles made possible by antiseptics.